Home Knife News Wire BLADE’s Complete Knife Guide On Newsstands Now! BLADE’s Complete Knife Guide On Newsstands Now! 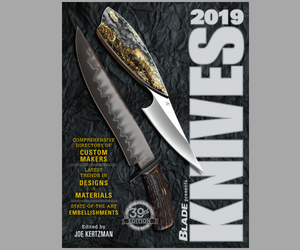 BLADE’s Complete Knife Guide—your ticket to everything knife—is on newsstands now! BLADE’s Complete Knife Guide (BKG) is the only knife buyer’s guide in a magazine format that gives you all the contact information for all the major players in the custom and factory knife industries—all in an easy-to-access format that provides each knife source’s physical and web addresses, phone numbers, specialties and much more. There’s much more in this issue, including new knives for 2014; knife guards that both protect and adorn; what makes some of the latest factory tactical knives tactical; today’s top knife steels and who makes them; special deals on how to make a knife on a budget; some of today’s top custom knife purveyors; sharpening made easy and much more. For the latest knife news, stay tuned to www.blademag.com.